In this second gameplay video, you will see 8 minutes of gameplay taken from the Uayeb Demo version. Also Uayeb is now on Steam. In this second gameplay video, you will see 8 minutes of gameplay taken from the Uayeb Demo version. - UAYEB makes its first steps on the Steam Greenlight, and it has now its Concept page! You can rate the game (if you like it or not). You can add the game to your Steam favorite. 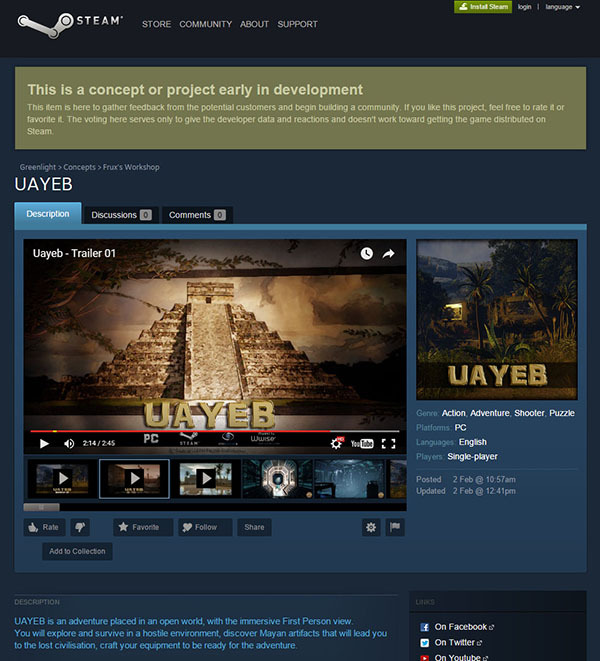 You can follow Uayeb on Steam (to receive all news). You can Share Uayeb with your Steam friends. You can add the game to your Greenlight collection. UAYEB is an adventure PC game placed in an open world, with the immersive First Person view. - Survive, adventure, investigations, puzzles, weapons, vehicles, are plan to be part of Uayeb world. UAYEB is developed by on person only, and it is currently in pre-alpha version for Windows PC. Please support the project with a like on the video, on the Facebook page, and subscribe to the UAYEB Youtube chanel to know when the next video is ready to watch. I love the graphics on this one and the music as well! This game gives off that powerful 'you're alone' kind of feel and in my personal opinion that inventory kinda gives it all away. Thank a lot for your comment BurezuWolf! About your suggestion: The inventory in the game is the computer of your friend Joanna, this is why it is not dark. Anyway this is a pre-alpha version and it is subject to change, and all suggestions are very welcome. Thanks again.